BJ's true old-fashioned batch ice cream. 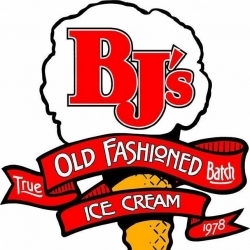 BJ's is family owned and operated, serving 5 generations of homemade ice cream, fudge, caramel corn, ice cream cakes and more. BJ's ice cream offers hand blended shakes, splits, sundaes, and other delicious treats. Now featuring Pastega Coffee Roasters hot and cold brew coffee. Stop in today or visit on of our 8 other locations. BJ's homemade ice cream, come taste the difference!